^ Dougal Dixon et al., Atlas of Life on Earth,（New York: Barnes & Noble Books, 2001）, p. 215. ^ The Berriasian Age 互联网档案馆的存檔，存档日期2010-12-20. ^ 14.0 14.1 14.2 MacLeod, N, Rawson, PF, Forey, PL, Banner, FT, Boudagher-Fadel, MK, Bown, PR, Burnett, JA, Chambers, P, Culver, S, Evans, SE, Jeffery, C, Kaminski, MA, Lord, AR, Milner, AC, Milner, AR, Morris, N, Owen, E, Rosen, BR, Smith, AB, Taylor, PD, Urquhart, E & Young, JR. 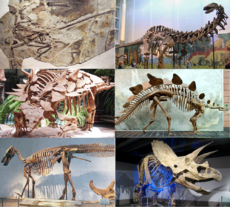 The Cretaceous–Tertiary biotic transition. Journal of the Geological Society. 1997, 154 (2): 265–292. doi:10.1144/gsjgs.154.2.0265. 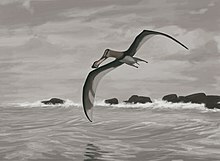 ^ 17.0 17.1 （英文） Sheehan Peter M, Hansen Thor A. Detritus feeding as a buffer to extinction at the end of the Cretaceous. Geology. 1986, 14 (10): 868–870 [2007-07-04]. ^ （英文） Aberhan M, Weidemeyer S, Kieesling W, Scasso RA, Medina FA. Faunal evidence for reduced productivity and uncoordinated recovery in Southern Hemisphere Cretaceous-Paleogene boundary sections. Geology. 2007, 35 (3): 227–230. doi:10.1130/G23197A.1. ^ （英文） Sheehan Peter M, Fastovsky DE. Major extinctions of land-dwelling vertebrates at the Cretaceous–Tertiary boundary, eastern Montana. Geology. 1992, 20 (6): 556–560 [2007-06-22]. doi:10.1130/0091-7613 (1992)020<0556:MEOLDV>2.3.CO;2 请检查|doi=值 (帮助). Ogg, Jim; June, 2004, Overview of Global Boundary Stratotype Sections and Points（GSSP's）https://web.archive.org/web/20060423084018/http://www.stratigraphy.org/gssp.htm Accessed April 30, 2006. Rasnitsyn, A.P. and Quicke, D.L.J. History of Insects. Kluwer Academic Publishers. 2002. ISBN 978-1-4020-0026-3. —detailed coverage of various aspects of the evolutionary history of the insects.